I just signed up for the Walk4Hearing event on October 18, raising money for the Hearing Loss Association of America's efforts in hearing loss prevention and education. Sponsors welcome, and much appreciated! My donation page is here. Thanks. 38A. "LAY IT ON ME" is clued ["I'm listening, bro"]. Love the answer, loathe the clue. What is that? What Frasier Crane says to Niles in a moment of whimsy? I'd go with ["All right, let's hear it"]. No, wait, that's got an "it" in it. Maybe ["All right, I'm listening"]. No "bro." 7D. The OOMPA-LOOMPAS! They're [Willy Wonka's work force]. Do you prefer the little people in the first movie adaptation, or the digital duplication of Deep Roy in the Johnny Depp movie? 6D. [Ones who are too big for their britches] are WHIPPERSNAPPERS. Great word. 23A. MEA CULPA is an [Admission of sorts]. 6A. And who doesn't love a WORD GAME? The clue, [Ghost, e.g. ], wasn't helping me much. I don't think I've played Ghost. 46A. SPAMALOT! That's the [Tony winner between "Avenue Q" and "Jersey Boys"]. 16A. HOOLIGAN! That's a [Tough]. Great word. Is somebody's great-grandparent inside this puzzle casting aspersions on the HOOLIGANs and WHIPPERSNAPPERS who are leaving [Graffiti, say] (MARKS) on public property? 31A. PIROUETTE is a [Revolutionary dance move?] in that you revolve on your toes. 35A. [Services aces?] leaves the realm of tennis and moseys into church services and PARSONS. 42A. The hair SALON is [Where locks are changed?]. 2D. This one! *shaking fist* [Like Japan's national diet], straight-up, no question mark, has nothing to do with food intake. It's the legislature, the Diet of Japan, that is BICAMERAL (two-chambered, like the U.S. Congress). 3D. [Dark matter?] clues ESOTERICA. I'm not quite sure how the clue relates to the answer, but I think I like it anyway. Arcana and the occult are dark, but ESOTERICA is just highly specialized. What am I missing here? 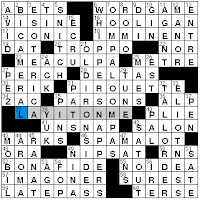 There's an assortment of tough clues, too, as you'd expect for a Saturday puzzle. 49D: [Noel Coward title woman "from Argentina"] is NINA; musicals are not my thing. 17A: [Kind of statue or status] clues ICONIC; clue feels nonspecific to me. The [Bust of Pallas, to Poe's raven] is its 27A: PERCH; just wasn't putting the words together right here. 30A: ["___ the Viking," 1989 film starring Tim Robbins] is ERIK. Really? I have zero recollection of that. 9D: [Sixth-century year], bleh, DLI or 551. (Could also have been DII, DIV, DVI, DIX, DXI, DXV, DXX, DLV, DLX, DXC...) 12D: [Reeve's charge] is MANOR; Chaucer's Reeve was "manager of a large estate." Do you know your Spanish? 13D: [Between, to Batista] is ENTRE, same as in French. 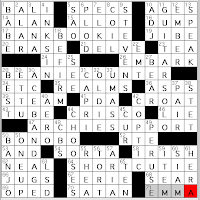 26D: [Ending for a record] is the superlative suffix -EST; the puzzle's docked 10 points for having both this and SUREST in the grid. 17A. Bankbook + ie = BANK BOOKIE [Person taking bets on financial institutions?]. Do banks still issue bankbooks (a/k/a passbooks) these days? I think I last had a passbook sometime in the early 80s. Is the bankbook something else that has become a "quaint" reminder (or relic...) of the way we did things "in the old days"? 28A. Bean counter + ie = BEANIE COUNTER [Where some hats are sold?]. Wow. I was surprised to seen that bean counter has been an "in the language" phrase only since 1975. Or that's what Merriam-Webster says. 47A. Arch support + ie = ARCHIE SUPPORT [What Veronica supplies?]. 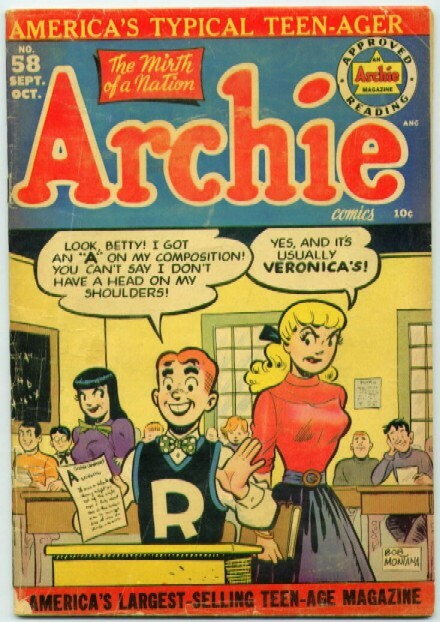 While I always felt that Betty could be counted on to offer more reliable support, it was Veronica who had his heart. These forever-young teens have been around since 1941. Do see what they've been up to lately, with story-lines that include weddings and babies and Robert Frost's "The Road Not Taken." No kidding. 64A. Short cut +ie = SHORT CUTIE [Munchkin?]. While the OED tells us that a munchkin is "a small and endearing person; esp. a child. Also used as a term of endearment," the term first appeared in 1900 in L. Frank Baum's classic, The Wonderful Wizard of Oz. Happy 70th Anniversary to the movie! GUITAR SOLO [Flamenco piece, perhaps]. Or classical, or blues, or rock or jazz or any number of genres. Here's a list of some of the great guitar soloists in several styles. In folk groups you'll often hear not only guitar solos, but also BANJO solos. The banjo, of course, is the [Instrument for Pete Seeger]. If you've never seen The Power of Song, a 2007 documentary about Seeger, it's really worth a look-see. BONOBO ["Pygmy chimpanzee found only in the Democratic Republic of the Congo"]. That's the only place in the world where you'll find these long-legged chimps (with their oh-so humanoid physical traits) living in the wild. Two terrific clues for two tiny words are [Frequent joiner] for AND, and [Lousy in Eng. class] for ADJ. (i.e., in a discussion of "parts of speech," the word lousy is an adjective...). I like Brad's puzzles, but of course I'd prefer a Saturday puzzle clued harder than the Wednesday level. 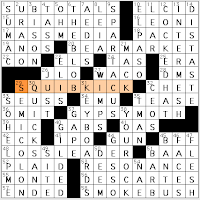 As I said over at L.A. Crossword Confidential, SQUIB KICK (29A: [Football boot that takes unexpected bounces]) was my big "Wha??" answer: Never heard of it! My son's been playing the Madden NFL '08 video game on Wii, though, and he's learned a lot about football from it. More than I know, actually. Shouldn't "squib kick" be used more broadly, in situations where life takes unexpected bounces? 15A: [Blackmailer in "David Copperfield"] (URIAH HEEP). You'd be crooked too if your parents named you that. This is also the name of an old British rock band. Great entry, but depressing. 20A: [Wall Street down time?] (BEAR MARKET). 37A: [Foliage-eating pest] (GYPSY MOTH). With the PS in place, I blithely filled in SAPSUCKER, but that's a bird and sap ≠ foliage. Whoops. I fear I am too old for this one: 45A: [Closest pal, in texting shorthand] (BFF). Short for "best friend forever." My kid? He's nine. He's the right age group to use "BFF." If you are over 18, please do not use this abbreviation. Ever. Botany! 58A: [Shrub with fluffy grayish flower clusters], the SMOKE BUSH, is also called the smoke tree, and the flowers aren't always gray. It's closely related to 1D: ["Poison" plant] (SUMAC). Oh, no! Look out! It's THE BLOB! (6D: [Amoebalike movie alien]). I kinda want to switch the clues for 6D and 9D, so that the [Title gladiator played by Kirk Douglas] is THE BLOB and the amoeba monster is SPARTACUS. My favorite Spartacus is Hank Azaria's Agador Spartacus in Birdcage, but my favorite character in that movie is Nathan Lane, particularly when he tries to butch up but wears bright pink socks with a suit because "one wants a hint of color." Words to live by. 38A: [Exuberant modern compliment] ("YOU ROCK!"). Love it! I actually use this phrase, and it's possible that I shouldn't. Not all the fill was as entertaining as those answers. INTERMESH and pretax SUBTOTALS and an oddly COCKED HAT didn't do much for me (though the dictionary tells me a COCKED HAT is a thing, a "brimless triangular hat pointed at the front, back, and top," is it a hat any of us have heard of?). The short stuff also seemed heavy. Five entire Across rows and three Downs containing nothing but three- to five-letter words? ANOS, TAS, DMS, OAS, ECK, IPO, Spanish URANO (2D: [Seventh planeta]), the old crosswordese 7D: Dreaded mosquito, AEDES? Meh. Barry Silk's Newsday "Saturday Stumper"
I wasn't quite sure my solution was correct until I checked the PDF. 37D: [End neighbor] clues PGDN. That's the "page down" key on a computer keyboard. On my Apple keyboard, do you know what that key says? It's labeled "page down." My husband's Windows laptop has "Page dn." Does anyone have PG DN? Since when are 1A: [Burger and fries] COMFORT FOOD? The clue should read [Grilled cheese and tomato soup], obviously. 21A. [Cracker sandwiches] are S'MORES. Yum! I just bought all the fixings to make these—except I just realized that my Peapod grocery delivery did not inclulde the chocolate bars I thought I ordered. The system was haywire and a bunch of things I wanted vanished from my virtual cart. Chocolate! Must buy some today. 55A. [She's not talking] clues a MIME. Three cheers for a clue that doesn't use a male default. 62A. AHMAD RASHAD's name was not coming to me, and any TV name starting with AH was looking unlikely. He's the [Former "Celebrity Mole" host]. I halfway wanted to squeeze Anderson Cooper in there. What did he host in his pre-CNN days, non-celebrity The Mole? Ahmad's sitting on top of another 5/6-letter full name: LORNE GREENE was the [Prosecutor portrayer in "Peyton Place"], which (a) was before my time and (b) is a clue with too many Ps. I didn't know AUTO-REVERSE a week or so ago when it was in another puzzle but now? It was my #1 guess for [Cassette-player feature]. Too bad [Holy ___] clues only SEE (65D) and not also MACKEREL (24D, [Salt-cured sushi]). Did you know MR. T is now a [Tormenting voice on some GPS devices]? Poor guy, always typecast. Why wasn't he cast opposite Jack Nicholson in The Bucket List? Where is his romantic comedy career?